These Cinnabon Cinnamon Rolls Copycat are one of my favorite recipes of all time! I could eat a whole pan (and sometimes do)! These Cinnabon Cinnamon Rolls Copycat are as close as it gets. We made these every Christmas and every special occasion for breakfast. I am sorry for my absence. I have been under the weather. I am better now and ready to cook! Christmas morning things are chaotic. So this is what I make for breakfast because these can be made the night before and then just thrown in the oven in the morning while you open presents. I always serve these cinnamon rolls with this yummy savory breakfast casserole which can also be prepared the night before. Yes, these rolls taste so much like the original that the first time I made them I was almost giddy that I actually made THE “Cinnabon” rolls! Cinnabon’s cinnamon rolls are heavy on the cinnamon which I love. I’ve learned over the years that you can even make them the night before and let them rise while you sleep! This is what I woke up to. The other secret is to frost them with half the frosting right when they come out of the oven and with the other half after they’ve sat a couple of minutes. That way the frosting kind of oozes down into all of the cracks. 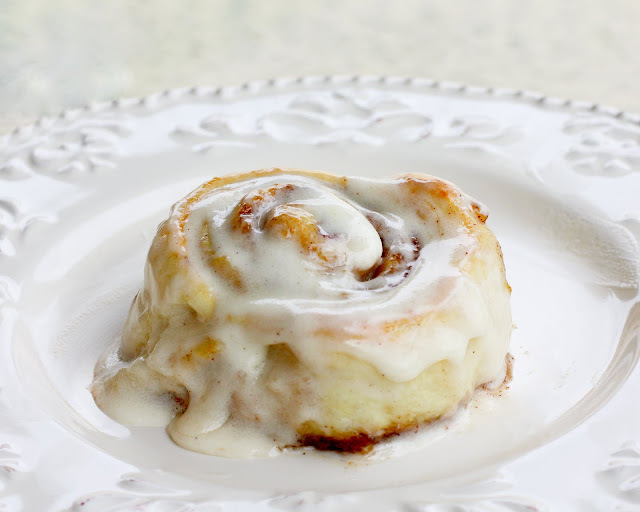 Pictures don’t do these Cinnabon Cinnamon Rolls Copycat justice! In a small bowl, thoroughly combine brown sugar and cinnamon. Spray surface with cooking spray or sprinkle flour on it. Roll dough into a 16x21 inch rectangle about 1/4 inch thick. Spread dough with 1/3 cup softened butter and sprinkle evenly with sugar/cinnamon mixture. Roll up dough starting with the longer side and cut into 12 large rolls (or 18 smaller rolls). Place rolls in a lightly greased 9x13 inch glass baking dish (or you may need 2 dishes if you make smaller ones). Cover and let rise until nearly doubled, about 30-60 minutes. If making the night before I let them rise covered with a dish towel on the counter overnight. Meanwhile, preheat oven to 350 degrees. Bake rolls in preheated oven until golden brown, about 18-20 minutes. While rolls are baking, beat together cream cheese, butter, confectioners' sugar, vanilla extract and salt. Spread half the frosting on them while they are still warm so that the frosting melts into the roll and the other half after they've sat for a couple of minutes. That's what the Cinnabon people do (I asked them). Makes 12-18 rolls. If you want to make these the night before, shape the rolls and cut then into slices and let them rise on the counter covered overnight. Bake in the morning according to the directions. Cinnabon is known for their intense cinnamon taste. 2 1/2 tablespoons of cinnamon is a lot but if you're not sure you can reduce it to 1 tablespoon of cinnamon. I made these but added raisins n Wal nuts and added grated orange zest n fresh Juice to the frosting . THEY KILLED one person even made the comment ” omg they taste like a cinnabon cinnamon roll. ” I chuckled. My question is can u freeze these and then bake them ? Or unfreeze then let rise . ? YEs, exactly. Freeze and then thaw and rise and bake. What do you do with leftovers? Are they good the next day? Um yes. They are fabulous. Words can’t describe how amazing these turned pout to be!!!!! Would recommend to anyone, and have already recommended to my Nan and her spaghetti. yo sweetie, aren’t you allergic to cinnamon??????????? I often eat the whole tray. Hi there i made those a few times they are awesome , should i proof the yeast first never did i just mix it all and rises fine….1 more question is when i ice them right out of the oven it seem to flatten them any idea ???? I’ve been making these rolls as a yearly Christmas tradition – thank you for the recipe! Do you think making them a day ahead and leaving it out during the day and overnight would be ok? I’d bake them Christmas morning. I’m not sure. I actually have left them out overnight to rise (of course I went to bed a 1AM) so I think it should be fine.